Since I moved my blog to WordPress, I’ve been browsing some of the other blogs on the site. I quickly found The Daily Post which offers blogging tips as well as a daily prompt. The World Cup Games inspired today’s prompt, “Offside Memories,” about funny, harrowing, or notable memories from sports we’ve watched, attended, or played. Once, I even received an award for sports! When I was in eighth grade, I was on the tennis team. I can’t remember why I decided to sign up. 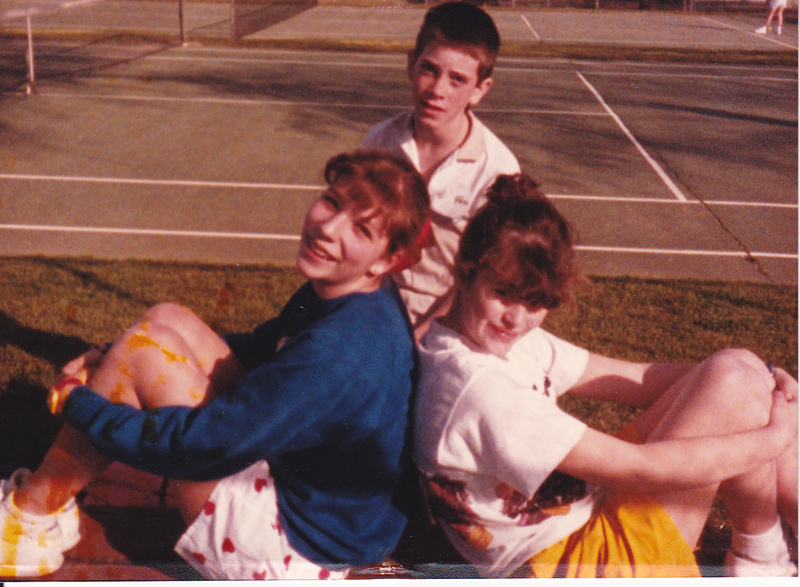 Given my priorities at the time, I likely had friends who played or a crush on a tennis player. Back in fourth grade at Oak Hall, our class did play tennis regularly, but I hadn’t picked up a racket since then. The summer before 8th grade, I signed up for tennis classes. On one of Oklahoma’s hot, humid summer mornings, I was standing on the court with a group of other students learning how to do a backhand stroke. We must have repeated it 300 times! I’ve never liked being hot or sweaty. I was probably daydreaming about whatever boy was striking my fancy at the time or thinking of how thirsty I was. Suddenly, I was looking up into a circle of faces, some concerned, some devilishly delighted. I had fainted – someone said because I had locked my knees – and fallen like a plank onto the tennis court. Sure, it could have been worse, but it was bad. My chin had busted open when it hit the ground. One of the coaches took me to the emergency room, but they hadn’t gotten parental consent forms, so the doctors couldn’t treat me. (I think that I single-handedly changed the registration process for tennis classes to include parental consent forms in the case of emergencies.) My mother picked me up and took me to the doctor for stitches, and my aunt Lizzie joined us there. I asked her how bad the carnage was. She replied, “Remember that scene in Poltergeist where the man is tearing the flesh off his face?” The next day, I had to see my dentist for a tooth reconstruction because one of my molars split in two. Despite that inauspicious beginning, I remained enthusiastic about joining the tennis team. The first step was taking a written exam covering the rules of the game. I earned the highest marks, thank you very much. I’ve always been good with things in theory. In practice, however, I was not a tennis whiz. I remained, to my horror, at the bottom of the ladder all season. I really hated tournaments, though I did enjoy away matches when we’d pile onto the old yellow bus. I also enjoyed my new, chic tennis racket and cute tennis skirt and bloomers. Early in the season, I pulled a groin muscle and was sidelined (to my relief) for a few weeks. When the season was over, I resolved not to join a school sports team again – and I did not. I also never picked up a tennis racket or played tennis again. It was not my finest moment. My family like to reminisce that, although my tennis career was an undisputable failure, I did receive the “Scholar Athlete” award at the end of the year ceremony. I still feel slightly guilty. I was never really an athlete at all. My hand is healing (though still pocketed with little bite marks and now an unnatural shade of brown) and is fully functional though a little painful. Unfortunately, I had a very bad reaction to the amoxicillin the doctor prescribed for infection. I’ve been knocked out all week with stomach pains, fatigue, and headaches. Now that I’m off the pills, I hope I will start feeling better. "You’re No Good with One Hand"
Thursday morning, when I fed Walter and Harvey, I dropped some kibble on the floor. When Walter was done eating his food (which takes about 10 seconds since he inhales it), he ran around the counter to get the stray kibble. I wasn’t paying close attention, and in that minute, Harvey got very pissed off that Walter would intrude on his food space. He grabbed Walter around the neck, growling and biting with menace. Although George has repeatedly told me not to get between them when they fight, I grabbed Harvey’s color with my right hand and his jaw with my left so that Walter could escape. Since Walter weighs about 21 pounds and Harvey almost 90, to me, this was a matter of life or death, and I was much more concerned about Walter than my hand. Walter ran off and hid in the closet while Harvey went back to eating his food and I was left to deal with my injury. My first clue that I was in trouble was the lack of pain. I figured it hurt so much, I wasn’t processing it. Then there was the blood. And the swelling. And the discoloration. I knew I had to go to student health–groan. But later that night, I had to teach, so I couldn’t leave New River until I became somewhat presentable. At student health, I was seen quickly. First, they soaked my hand in Betadine and warm water for what seemed like an eternity (and made me late for a meeting with Peter). The doctor said that he didn’t want to give me stitches so the wound could breathe, but he wasn’t too optimistic: “You don’t have an infection, yet.” He put me on antibiotics, had the nurse put a splint on my middle left finger (the site of the worst puncture), and asked me when I’d last had a tetanus shot. I was desperate to think of a time recently when I’d had one, and I could feel myself becoming faint. Alas, I couldn’t come up with anything except in 1994 when Anna and Steve took me to the University of Chicago Hospital ER after Socrates, the iguana, bit me. I told the nurse that I was feeling faint, and I lay on the table. At that point, with some irony, she said, “I like your tattoo.” I responded it was a little silly for someone who had tattoos to be scared of shots, but there it is. Luckily, the shot was in the arm, not hip, and it was very quick. In the office for only an hour, I had to abandon the splint–otherwise, I couldn’t work on the keyboard, and that is absolutely essential. 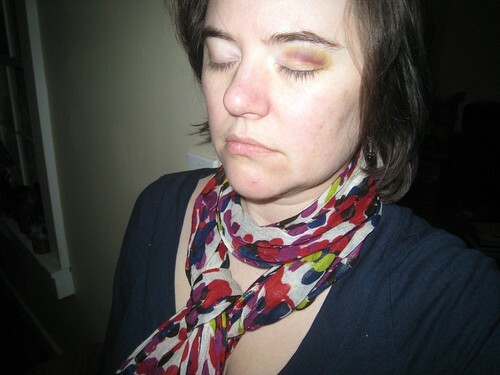 Now, two days later, I am beginning to feel less pain, and I think I may be able to hold jewelry pliers tomorrow. (For now, gripping hurts too much.) I am taking pain killers and the antibiotics and wondering when my hand will be back to it’s normal transparent chalky white instead of dirty green-blue. I tried to construct a viable tale for George so he wouldn’t kill Harvey, but I’m not a good liar. As expected, George is furious with Harvey and furious with me for getting in the middle. Yesterday, I bent over to plug in a power strip in our office. Unfortunately, a waist-high self with a very sharp corner was between my forehead and the outlet. The pain was so intense I sobbed. Ever since, I’ve been a little loopy and unbalanced. It’s more pronounced when I’m trying to have a conversation with someone–I find I have a hard time concentrating and finding the right words (even more so than usual). I’m sure I have a concussion. I should probably go to student health, but I hate visiting the clinic. Besides, the Mayo clinic said the best treatment was rest. Of course, it’s for something this ridiculous instead of a funny, interesting story.